‘Comfortable’ was a word that was used frequently to describe the Adidas Ultra Boost ATR. This shoe looked visually appealing, many runners commented. Some consumers were able to use this shoe casually, and they wrote that it remained agreeable. The waterline layer in the bottom part of the mesh fabric gained positive remarks because it efficiently staved off the water. The general durability of this shoe received praise. Runners were receptive of the boost™ cushioning system, stating that’s a responsive platform to rest their feet upon. There were consumers who reported that the protective forefoot section of the shoe saved toes from being hit by debris. The testers felt that the Adidas Ultra Boost ATR was efficient for running long distances. This shoe was ½ a size smaller than what some runners were used to. A tester commented that the Primeknit fabric was woven poorly and that it came loose easily. The outsole didn’t hold onto wet surfaces well, a consumer reported. Many runners were able to enjoy the Adidas Ultra Boost ATR. They felt that it was efficient as a long-distance running shoe and as a casual alternative for those regular days. They were also receptive of its design and its overall aesthetics. Its various components and features were admired, as well. There were a few gripes, but this trail shoe still became a popular one. Hands Up Who Wants it All! The ATR reminds me of Freddie Mercury famously crooning, "I want it all! ", so brazenly boisterous of one man to claim so and yet so humbling and true of us as a race; even when utterly modest, we humans want it all. Microwaves that can bake and grill to fridges that will keep tabs of what we are running short of. We want a car that looks good, is fast flat out, climbs hills like a goat and still delivers great mileage. We don’t want multiple tools for surgically precise purposes. Instead, we crave the do-it-all thingamajig short of hiring a butler. Give us the fruits minus the labor, we beseech the simple and the lazy. Which is mostly fine really — who is one to judge? — but then someone went and stuck this philosophy on a running shoe. And so, ladies and gentlemen, we have the Adidas Ultra Boost ATR or, the All Terrain Running shoe, from the successful Ultra Boost lineup. Yes sir, you now have it all in one pair: go up, or down, blaze forth on roads and over rocks, off track and on tar, this one shoe claims to straddle it all. And it looks good to boot so you could just scramble around town in them too. Before I begin, I like the shoe. I really do. There are many things that this shoe gets right. In fact, there is nothing wrong per se with them but…well, let me get to it. So, let’s review this shoe top-down. A sock-like upper and a generous slathering of Boost midsole cushioning followed by Continental® rubber outer sole. So far so good. Compared to other in the Boost lineup, it is pretty sleek, second perhaps only to their uncaged versions. But, thankfully, this provides much better support and grip, especially around the heel area. For one, the sock rises higher than the regular UltraBoost (and much higher than the uncaged version) which makes it feel more reassuringly grippy around the feet, enveloping them better than any other pair I have tried, even across brands. The tab on the back certainly helps slip them on and off and once I had adjusted the laces, that’s precisely how I have been putting them on and taking them off, like moccasins! In general, the DNA of the (Boost) series runs deep: a light compact shoe with a 12-14mm drop I suspect, snug but thanks to the sock-like uppers, the toe box is accommodating, an otherwise common complaint with Adidas running shoes. The lacing runs through two strips stitched into the shoe rather than eyelets which are worked into the sock (many brands prefer to do that, including other models of Adidas Boost). I find that this style here feels more reinforced even though, considering it is still attached to the enveloping sock, you won’t feel a massive tightening when you tug at the laces. They allow for some adjustment but it’s largely minimal. I saw some runners doing away with them entirely and managing quite well which made me wonder if the laces weren’t merely a placebo? Next, the Boost foam, reliably comforting, a bit too much for my liking as I feel that somewhere in all that springiness one loses grip and precious time in the recoil. Adidas, however, contends that no time is lost as the extra push the cushion provides would not only make up for the time lost as the cushion compresses under your step but it also preserves energy thus helping you stay strong on your feet for longer. I won’t refute that but every time I have a shoe with plush cushioning, I end up training in them but rarely take them out as race-day gear. Apart from that, nothing new here. Continental® again, but this time the grid-like matrix is slightly raised, as in, the intersections are proper bumps that stick out prominently. On closer inspection they were marked with ‘+’ and ‘-‘ signs, possibly to indicate the degree of hardness or softness. The soft ones would be more ductile while the hard bits would provide the stiffness. Adidas’ in-house developed, tried-and-lauded Torsion system further adds to the energy distribution and transference. It is, however, a deep groove and the odd stone might (in my case, did) get stuck in it. This grooved surfacing is what gives the shoe its ATR DNA, else it would be a pretty standard one from the Boost lineup. Oddly, it reminds me of the sole that Reebok used on their Floatride series. I immediately put this shoe to test, starting with gentle flat roads and onto some elevation before finally hitting the dirt track. The shoe does hold well, allowing you to lean in on the turns as well. Even after an entire marathon (Tata Mumbai Marathon 2018) the feet didn’t feel too tired or worn out by the weight or such. The grip is definitely more lasting than I have usually seen on my other Boost pairs which have faded only too quickly. The distribution of the soft and stiff bits on the outer sole also helped change the way shoe moved under me in a largely positive way. To make an all-terrain shoe with a sock upper is like designing an earthmover with a soft top! It will not only provide inadequate protection but also wear out faster! During my trail runs, every thorny bush, every mid-size weed I crossed, ended up either getting lodged in the sock-uppers or else simply snagged a piece of thread from it. Barely a few off-road runs later, the top of the shoe looked a bit worse for the wear. Not to mention, the sock-top provides no protection whatsoever against anything that is pointy, sharp, or hard. I had a few breakaway pebbles fall somewhat on my feet and none of it was remotely reduced in intensity. Mid run, I had to take breaks to pull out thorns that had inadvertently gotten stuck to my shoes and were now pricking me through the upper layer! The heel support, while sufficient for the road and even climbs, wasn’t adequate for proper off-track rambling. And the smallest of water hazards will wet you to your skin! Sure you may not chafe just yet but it isn’t the most pleasant of feelings to have ATR shoes that get soaked five minutes into a run! In other words, this is a show-pony, kinda’ like an SUV that looks chunky and mean as long as you stick to the tarmac. It isn’t true 4X4 material! That said, the shoe is still one of the smartest looking running shoes I have ever worn, nay, adorned. The three stripes are 3D textured here, worked into the very sock fabric like color-on-color grooves. Very classy and worthy of major street cred. Frankly, now that I have decided to use it only for gentle runs, it is a great pair to travel with: decent for runs and looks good paired with jeans and such. Few running shoes can crossover to the urban-cool side with such ease. So it can be a two-in-one shoe which is great because, given their price, you could (almost) buy a pair of standard Adios Boost and a Stan Smith for the price of one of these! One caveat though: this is the first Boost where I wore a size smaller. Adidas generally used to run a size smaller and I would usually fit into a UK9 (Adios Adizero Boost, PureBoost, Ultra Boost) but this time I had to get a UK8. Either they have changed their lasts to reflect an upgraded sizing format or maybe because of the sock-upper I had to go a size down. Either way, do try it before you get it and definitely don’t go by previous sizing guidelines that you may have. So, if my mixed signals have made me sound like a fence-sitter on this, let’s do a quick sum-up. The Adidas Ultra Boost ATR, in many ways, reminds me of the Ford Model T.
Remember what the late founder said, ‘You can have any color Ford T as long as it is black.’ Similarly, this is a lovely all-terrain running shoe provided you stick to roads and gentle tracks. 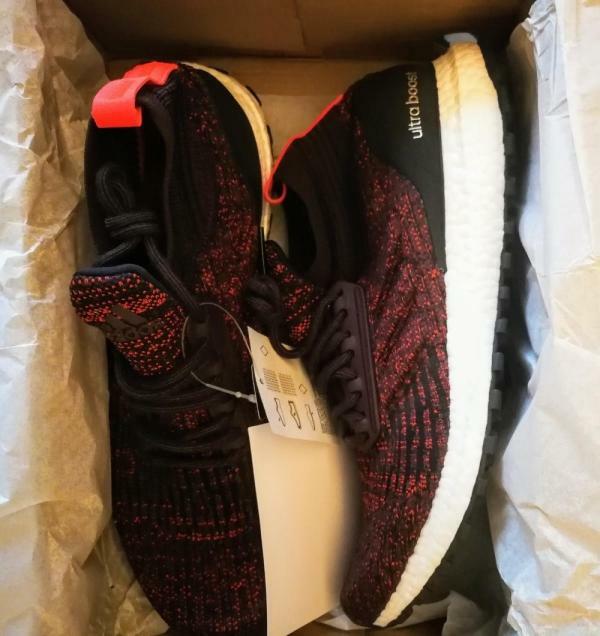 Over a month ago I made the decision to invest in my first pair of Adidas Ultraboost running shoes. Being a while since its initial release, the constant hype of the shoe along with the expert advice of friends prompted me to purchase my first pair; and never have my feet been happier. This is my reasoning why it was the right shoe for me, and how it could be the right shoe for you. The shoe takes the shape of a mid-top design. Unique to the running world, it takes form with a one-piece visually appealing Primeknit Upper, which is slightly thicker than the Primeknit of other Adidas shoes (Ultraboost, Ultraboost Uncaged, and the Adizero Prime). The upper can and easily repel moderate rain and splashes, yet you shouldn’t try your luck beyond that. The sock-like nature of the upper means the shoe can be easily slipped on without having to tighten the laces, and this is made easier through the addition of a heel pull-tab. A tongue of no necessary benefit to the shoe or the runner sits behind the laces yet adds a stylish aesthetic to the shoe. Reinforcements to the toe box add protection from stones, stumps and low scrub commonly found on off-route runs. The upper is finished off with subtle Adidas Branding to the tongue and sides of the shoe along with Ultraboost branding on the heel section. Undoubtedly the main reason why I picked this model, the shoe comes along with the benefit of the incredibly comfortable Boost™ midsole, which offers brilliant step-in comfort and an energized, smooth transition through the gait cycle of the foot, while giving the runner a responsive toe-off and a cushioned heel-landing. Plush and lightweight, I feel it outperforms rival cushioning technologies such as Brooks DNA AMP™, Nike Zoom Air™, and Puma NRGY™. The bottom of the shoe features a segmented, thick outsole which offers great traction across a variety of terrains in dry to adverse conditions. Compared to the outsoles found on other Ultraboost models, this outsole is a remarkable improvement over previous Ultraboost renditions, through its thicker rubber sole and a greater contact surface area, providing superior traction and most importantly increased durability, which is a massive plus as normal Ultraboost soles tend to wear through after a couple of months of use. The Torsion System underfoot provides a very stable, smooth ride. Built for neutral runners, it provides great arch support. The padded heel counter at the rear of the shoe locks the foot in while providing the Achilles Tendon with comfortable support. The mid-sock design of the shoe fits snug around the ankle, offering further support and comfort. 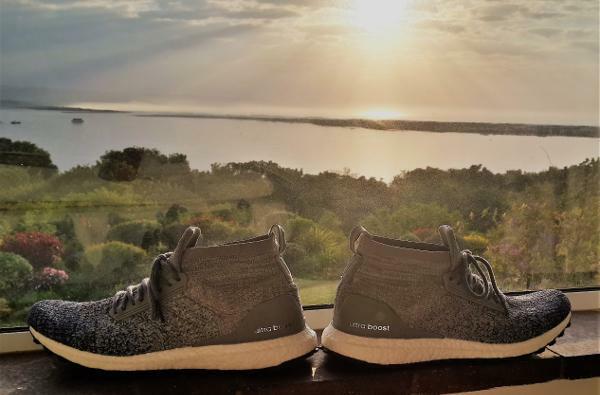 Whether navigating the urban jungle along the pavement or pounding down a dirt trail through the countryside, the Adidas Ultraboost All-Terrain performs admirably on a range of different surfaces and has even recently become my number one shoe to wear on beach runs. The soft sensation of the midsole, however, can prove to work against you at 10+ km and has a few times resulted in mild discomfort in the arch and balls of my feet. Due to the generally warmer climate here in South Africa, the thicker, water-repellent Primeknit is less breathable than the uppers found on the normal Ultra boosts, which may result in your feet feeling a bit warm. After 100 kilometers racked up in this shoe, however, it remains in pristine condition, with the outsole having worn very slightly. Despite the many amazing features this shoe comes with, it has a somewhat hefty retail price at 3500ZAR ($220 at US retail and £170 at UK retail), which can rule the shoe out as an option for some runners. Nonetheless, the shoe is stylish, incredibly comfortable and decently rugged. Yet breathability of the upper remains something to be desired, and should be a feature of the shoe Adidas should focus on improving. Overall, I have been thoroughly impressed with the performance of this shoe. Once again Adidas has introduced a fine addition to the Ultraboost range, and in turn, improves on the normal Ultraboost’s durability shortcomings. I feel still it is not a complete work, yet very close to what I would consider the perfect running shoe. Price point and breathability issues aside, they have been great on all my runs, and are equally at home for lifestyle use. The Adidas Ultra Boost ATR looks great and is unbelievably comfortable. I believe Adidas is onto something with this shoe and they offer decent quality for the money. It turns heads in the streets and propels you further on your runs. Overall, they are currently my favorite shoes and I am thoroughly impressed with what I have got. They have really made running a fun, exciting activity that is worth looking forward to, and an absolutely amazing feeling once on feet, making it compelling to go and grind down those kilometers. The comfort is the same, the performance is the same. It's my favorite shoe to run in. The Adidas Ultra Boost ATR is a trail running shoe that’s meant for those who have a neutral gait. It features a set of technologies that are meant to help the wearer traverse the off-road paths with ease and comfort. A casual look allows it to be used anytime and anywhere. The upper unit of this running shoe uses the Primeknit. It’s a soft fabric that’s likened to woven cloth. Its purpose is to wrap around the foot comfortably while also ensuring breathability. A fit cage made of TPU helps to keep the foot in place. A proprietary cushioning technology is used for the mid-sole unit of the Adidas Ultra Boost ATR. It has a springy nature and it attenuates the impact shock generated with every step. The midfoot section even has some extra support via the inclusion of the TORSION® SYSTEM. The outsole features gripping lugs, which help the runner to traverse the trails with ease. They’re not very aggressive, but they’re able to grip the ground well. Standard sizing schemes were used in the making of the Adidas Ultra Boost ATR. Runners can get the regular measurements that they’re used to. The available width for the men and women’s versions is medium. The outsole unit of the Adidas Ultra Boost ATR features Continental™ rubber. This material is a durable one and it’s meant to protect the rest of the sole unit from the abrasive nature of the trails. It also delivers traction, which is important for traversal. STRETCHWEB is a design that allows the platform to be more flexible. It employs a webbed pattern that doesn’t restrict the potential of the mid-sole to adhere to the movements of the wearer’s foot. The boost™ is the foam technology that’s used for the Adidas Ultra Boost ATR. This full-length foam material, which is also used in the Ultra Boost 19, is made from the amalgamation of thousands of TPU pellets. It provides a springy and responsive ride. Placed in the middle of the platform is the TORSION® SYSTEM. It acts as a foundation, so that the foot would remain steady throughout the running experience. Primeknit is the main fabric of the Adidas Ultra Boost ATR. This cloth-like material covers the foot securely and comfortably. It even encourages air to naturally enter the shoe in order to keep the interior as cool and dry as possible. TPU fit cages are added to the medial and lateral sections of the upper. They help in locking the foot in place and preventing it from wobbling inside the foot-chamber. A Waterline Layer is a printed overlay that’s resistant to water. Placed in the bottom part of the upper unit, it acts as a barrier against water-infiltration. The upper isn’t fully waterproof, but such an add-on may prove helpful for those who desire to run under wet conditions.